Reported to be one of the hardiest of all grape varieties. 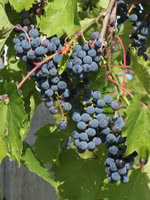 This variety will produce bluish red clusters of grapes that are great for jellies and juice. 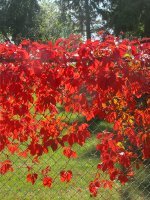 Grapes have long been used to cover arbors and trellises. This is a self-pollinating variety so only one plant is required to set fruit. Many like this variety for fresh eating as it is similar to concord grapes. Grapes are a higher maintenance species requiring regular care and pruning. Unchecked and uncared for grapes can spread, be eaten by birds, and have lesser yields. Applying a thick layer of mulch can help these vines overwinter better.